The backpacker in me is, frankly, geeked out! People who backpack know what these types of bracelets mean. They are a badge of honor. A statement of where you've been. They are a traveler's form of 'bling' right next to the stamps in your passport. I remember being in Thailand, skipping pass Khao San Road, and telling myself, 'Nomad•ness needs bracelets. The day I am traveliing somewhere and see someone I may not know rocking these bracelets I'm going to freak out (and or cry)." 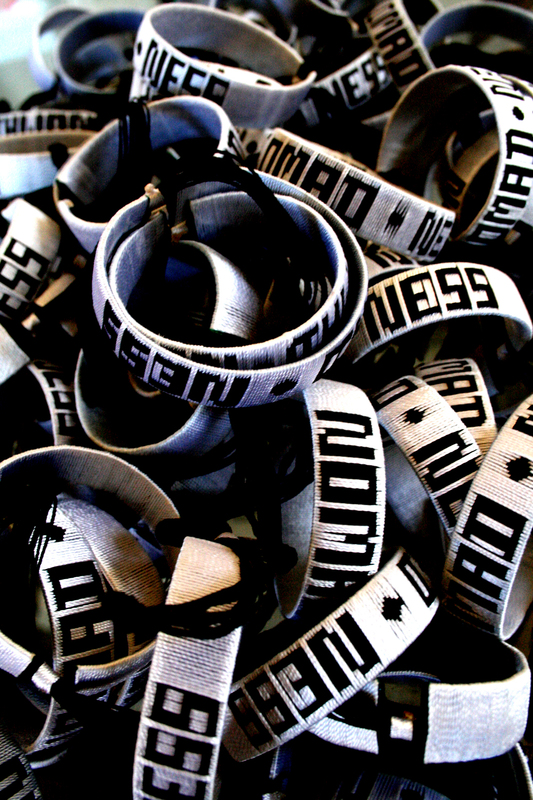 Well, well, we know what happens when I get to thinking... welcome to the first batch of Nomad•ness Bracelets. I am already rocking mine, proudly, and slightly egotistically. They are available for $4! Here on the site. Click any of these highlighted links or check out 'Tribe Merchandise' in the Nomad•ness Travel Tribe tab! Let's GO GET YOURS HERE!